An excellent introduction to the Stratigraphic Record. Ideal for high school and introductory college courses. This set represents a wide range of fossiliferous horizons organized chronologically from oldest to youngest. Many phyla are represented, providing an insight into the value of fossils in worldwide stratigraphic studies. 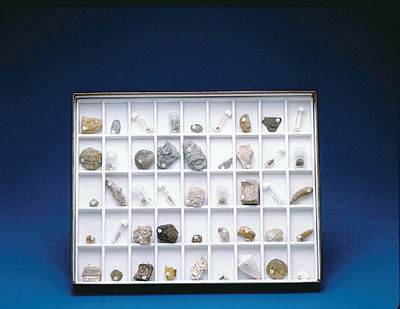 The set comes housed in a compartmented collection box and includes an identification list detailing name, age, stratigraphic data, and locality. Contents: 45 numbered fossils. Paleozoic Era (30), Mesozoic Era (7), Cenozoic Era (8).